What makes this Serpico y Laino Patek Philippe reference 2499 so rare and so important? If John Reardon, renowned Patek Philippe expert and Head of Watches at Christie’s, declares on social media that he is ‘excited’ about a watch, you can bet there is something truly unique and special about it. Reardon recently posted about The Serpico y Laino reference 2499 that it ‘set a new benchmark in my excitement of seeing a complicated 1950s Patek’. He then went on to describe the watch as ‘fresh to market, untouched, and preserved in truly original condition’. Given the watch sold for CHF 3,252,500 (almost $3.3 million) in the Rare Watches sale in Geneva, let us consider each of the elements that make this timepiece truly exceptional. 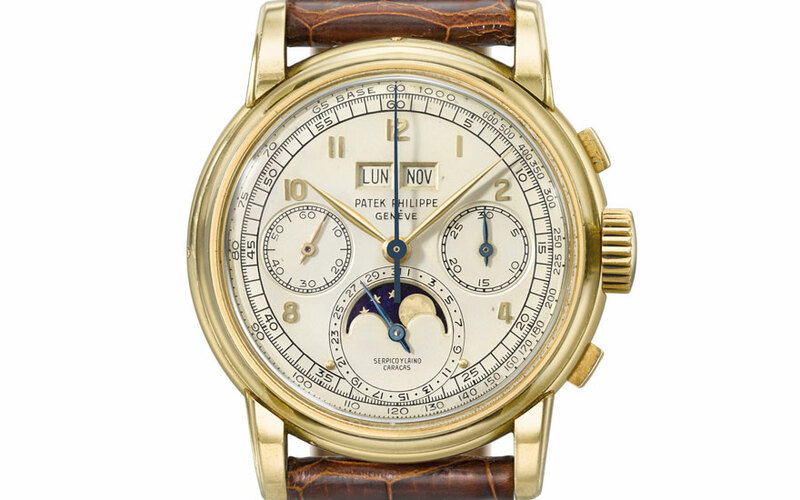 By the middle of the 20th century Patek Philippe was at the top of its game in the development and refinement of the Grand Complication that included a perpetual calendar and a chronograph. What had started with the design elements of the reference 1526 perpetual calendar, and the grand complication perpetual calendar chronograph reference 1518, was now being refined both in terms of aesthetics and the mechanics. The dial design layout set by the reference 1518 was to carry through to later references with the same set of complications, and still does to this day (just look at this year’s release of the reference 5270P). It has the now classic layout of twin apertures under the 12 for day and month, chronograph subdials at 3 and 9, and with a moonphase at 6. No other watch manufacturer was making such complicated watches at the time, and would not do so for more than half a century. Quite simply, Patek Philippe was in a realm of its own. As the reference 1518 started to wind down in 1951, the reference 2499 was started up alongside it, but whereas the 1518 only lasted 13 years (from 1941 to 1954), the 2499 would last a remarkable 35 years in the Patek Philippe line-up, becoming the company’s benchmark grand complication. The first series of the newer reference 2499 shared some common features with the 1518: the square pushers, the hands, the dial and the applied Arabic numerals. The case design, however, was altered to a more avant-garde form — augmented dimensions giving the reference 2499 a more modern aesthetic and greater presence on the wrist. With Patek Philippe confirming that this example reference 2499 was produced in 1952, case-making by Wenger for the reference can be backdated before the reference 1518 was ended, demonstrating that Patek had decided to adopt a more modern stance in terms of aesthetics for the new perpetual chronograph reference. The 2499 reference went through four iterations, and the level of rarity depends on which of the series you are looking at. For example, the tachymeter scale was omitted from the dial on the series 3 and series 4, which is unusual given the fact that there is chronograph function to the watch. Other factors to consider for the reference 2499 include the type of gold or metal used in construction, and whether or not a retailer’s name appears on the dial. A first series 2499 is often described as the rarest and most desirable. This is because the same set of talented watchmakers would have been finishing the reference 1518 and starting the new reference 2499 at the same time, meaning that fewer of the new reference watches were made. The reference 2499 shared the same movement with its older sibling: the 13’’’130 based on a Valjoux base ébauche. However, Patek developed the base ébauche to contain a straight line lever escapement, Côtes de Genève decoration, a self-compensating overcoil and a swan-neck regulator. The movement was erudite in form: the chronograph and perpetual calendar, as well as the watch’s other mechanical functions, were completed with only 23 jewels. In total, across four iterations and 35 years, just 349 examples of the 2499 reference watch were made, which equates to around 10 watches a year. The first and second series each lasted for only four or five years, making them the rarest of all. The most common reference 2499 is the third series (1960 to 1978), which accounts for approximately half of the watches made. The fourth series, which rounded out the reference up to 1985, accounts for approximately a quarter of the total, with some carrying the reference 2499/100. You have to earn the right to put your name on a Patek Philippe dial. It is an honour given to a small number of retailers who were prominent in either their country or region. Tiffany & Co is arguably the most famous, and to this day its name still appears on the dial of a few Patek Philippes. A number of reference 2499 watches have appeared over the years with different retailers on the dial; these include a fourth series 2499/100 with ‘Beyer’, a fourth series with ‘Tiffany&Co’, and a third series with ‘Gobbi Milano’. The importance of a singular retailer with a special case is evidenced by Christie’s selling a reference 2499 (first series) with ‘Cartier’ on the dial for $2.75 million in May 2012. The watch offered in Geneva in November 2018 is the only known reference 2499 across its complete 35-year production run to have ‘Serpico y Laino Caracas’ on the dial. Vicente Laino was born in Italy and emigrated to Venezuela in the 1920s. Settling in Caracas, he went into business with Leopoldo Serpico, a fellow Italian immigrant. With wealth levels in the country rising on the back of the post-war oil boom, Serpico y Laino set about looking for watches to sell to the newly affluent sections of the population, and went into business with Patek Philippe. As trained goldsmiths, both Serpico and Laino would have appreciated the design and manufacture of the Wenger case with this reference 2499. While Serpico y Laino did not sell at the same scale as Gondolo y Labouriau in Brazil, it was a prominent and important enough firm to have its name added to the dial. In some senses the fortunes of Serpico y Laino are reflected in those of Venezuela — the name of the firm still exists, and the same watch brands are represented, but as with the fortunes of the country at large, Serpico y Laino has largely squandered all that its founding fathers strived and planned for. In the vintage watch world condition is of paramount importance, and can result in significant differences in price. Two watches can be, for all intents and purposes, identical, but the watch in the more original condition will always have greater appeal to the more discerning collector. With this ‘Serpico y Laino’ first series reference 2499 there have been no cosmetic touch-ups, no ‘cleaning’ that would lead to a denuded features on the dial, and no polishing of the case. There are a few signs of spotting on the applied Arabic numerals and the dial; but the dial still has the original finish, as evidenced by the accent applied over the ‘E’ in Genève, and the raised hard enamel signature and scales. Adding to the originality is the fact that the day and month dials are in Spanish. The dial, over time, has coloured to an ivory patina, emphasising the lack of any cosmetic treatment to the surface. This watch is truly a remarkable discovery — the most desirable of the Patek Philippe perpetual calendar chronograph Grand Complication references in arguably its most desirable and avant-garde form. Such was the design brilliance of the reference 2499 that Patek did not feel the need to introduce another complete reference for the perpetual calendar chronograph for 35 years, and the history, rarity and remarkable condition of this example make it unique.